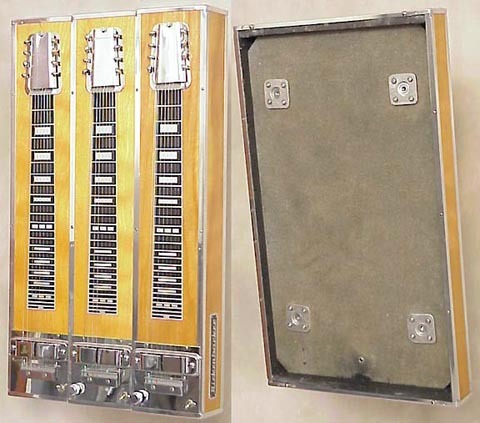 The 500 series looks to have been introduced in 1954-55, as a triple neck, 22 1/2 inch scale console style steel guitar, following the DW (double 6 or 8) and SW (single 6 or 8) models introduced a few years earlier, which had a contoured body and tripod legs. The 500 series was available as either three 8 string necks (508) or an 8/10/8 configuration (518). Custom configurations could also be factory ordered with combinations of 6, 8 and 10 strings. The instrument features three horseshoe pickups, one volume and one tone control, plus on/off switches for each neck, and was available in either natural or walnut. A double neck version became available in 1956 as the 200 series. The 25 inch scale 700 series was introduced in 1957, which in addition to the longer scale length, added more volume/tone controls. Pedals also became available as an option that year on all console models. Another notable difference is the through body string arrangement on the 700, where the 500 strings through the bridge block.